To the ancients the shape of Spain resembled a bull’s hide staked out in the sun. The comparison is an apt one, but gives an insufficient idea of the gouged out and serrated character of the land. The entire nation is a vast jumble of mountains, running in almost all directions, thus effectively walling off the distinctive regions. Even the central tableland of Castile is broken into smaller segments by transverse interior ranges. The geographic unity of Spain, therefore, is an illusion. Although the country has a compact appearance on the map, her various regions were, for centuries, mutually inaccessible. 1. The Cantabrian zone, composed of Galicia, Asturias, and the Basques provinces. Of these Galicia is the most cloudy, foggy and wet, but all three regions are green and cool, with fruitful fields, and an abundance of water. 2. The Pyrenees region lies to the east of the Cantabria, and is made up of three provinces, which are Navarre, Aragon and on the east coast, Catalonia, with its great capital Barcelona. To go eastward is to move from a primitive country of stolid, hardheaded jota-dancing peasants to a province of maritime wealth and thrifty, business-minded entrepreneurs. 3. The Castilian tableland, or meseta, occupies the center of Spain. It is composed of the ancient kingdoms of León, New Castile and La Mancha. Don Quixote and Sancho Panza were from La Mancha, this flattened land of cultivated fields where in years gone by, the hero of Cervantes and his stout squire tilted with windmills and scattered a herd of bawling sheep, taking them from an army of Moors. 4 Andalucía is southern Spain. This is where the Moorish tradition is strongest. Granada, Córdoba and Seville are its most famous provinces. The Moors called it Al-Andalus, land of the Vandals. 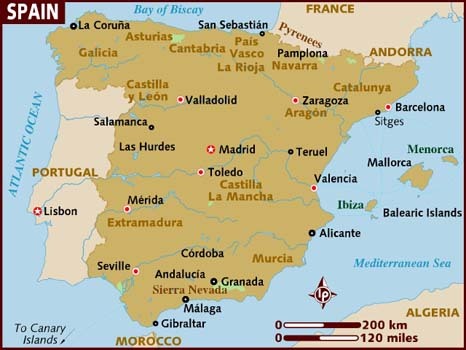 This is the African part of Spain; its tall mountains, just behind the costal plain, its rolling lower hills and olive groves, its fertile irrigated valleys, its Mediterranean climate, all these suggest northern Africa. 5. The Levant, or East coast, is a long narrow coastal province of Valencia. It is the irrigated citrus- and rice- growing region of Spain and one of the most productive area of the world. Such is the face of Spain in all its variety. We cannot seek for a common denominator in geography, or in landforms, or in climate. Even the language lacks uniformity. Religion did once unify but no more. The unity of Spain stands forth only as a vital structure of history, the sharing of a common destiny. Each of these separate regions is characterized by geographic, climatic, cultural, psychological, and linguistic differences. In many areas the children speak only the local dialect until they enter school, where they are taught Castilian. There is a considerable basis of truth in the old statement that every Spaniard’s first loyalty is to his patria chica, his small homeland or native region. Thus, the struggle for a stronger nationhood, carried on unceasingly for so many centuries by Castilians, has been impeded at every step by this primary loyalty to the native region. Nevertheless, the core spirit of Spain as we know her today is Castilian. To keep the record straight it must be pointed out that this longing for separatism, so strong in Catalonia and in the Basques provinces, does not express itself with such vigor in the other regions, where Castilian political hegemony is an accepted fact of life. This excessive regionalism emerges as one of the basic weakness of whatever system of national government the Spaniards have devised. Symptomatic of this disunion for many centuries was the country’s lack of a fixed capital. Paris and London have been the centers and capitals of their respective countries since their foundation. The capital of Spain was successively Toledo, León, Burgos, Seville, Valladolid, Segovia and other cities. Madrid was only a sprawling country town when Philip II finally moved his capital there from Toledo in 1561. Castile is the key to Spain’s communication systems. Madrid, in the very center of the Castilian meseta, is the hub or axis of all rail, highway, and airlines in the country. The first railway in Spain was that which ran from Barcelona to Mataró in 1848; the second was the line from Madrid to Aranjuez in 1851. The Spaniards were a few years late in getting their trains, as they have been a few years late in getting nearly every other product of industrial revolution. The idea of a train linking Spain with France naturally occurred to some Spaniards. But the memory of the French invasion of 1808 and 1823 was still vivid in many minds, and the reception given the suggestion was anything but enthusiastic. The line between France and Madrid was not opened until 1860, and until very recent years (1947), there was no railway between Madrid and Valencia, the country’s third largest city. “Altiva y pereza, llaves son de la pobreza.” Proud and poor, these two words fit the people of Spain like a glove. The Spaniard, it is true, would prefer to be a soldier, a priest or an adventurer rather than a laborer. But he is not lazy. He will carry out any task that is assigned to him with a diligence that is tireless. But he likes to perform it in his own way. The poverty of Spain comes from other things: the soil that has been denuded of trees and eroded by the rains, a government which has never had the people’s welfare at heart, a system of huge estates which have left the masses of rural workers without land, a lack of decent housing, industry and technological development and, last of all, a wealthy class that will not share and a mass of workers who will not cooperate. These concrete items, not lethargy, explain the poverty of Spain. Is it any wonder that the Spaniard clings to pride, which is his only true wealth? The proud and stoic attitude toward life of the Spaniard is, therefore, a philosophy of desperation.